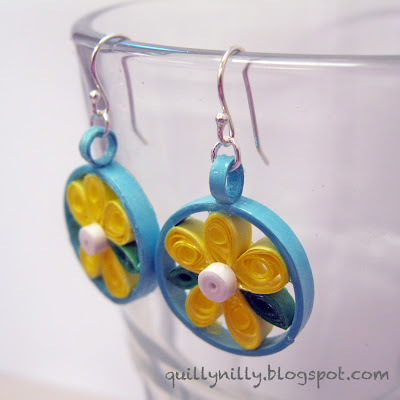 I promised a very close friend that for her birthday I would make her a pair of earrings out of paper. She thought I had forgotten so it was a happy surprise when she opened the box and saw these - yellow, teal and green; her favorite colors. I had fun making these earrings, and it was definitely a learning experience. I worked with Diamond Glaze for the first time and after seeing them so close (thanks to my awesome digital camera) I need to experiment a little bit more with it. I'm still finishing up a few custom orders I have for the tata magnets. For every set purchased I'm donating 40% to the Susan G.Komen for the Cure. Here's a photo of one set I completed. After the magnets I have snowflake ornaments to finish, then I'm moving on to an order I received recently for 25 all occasion cards - good to be busy. Wow, it's been a month since my last post; shame on me. I've spent the past 5 weeks in and out of doctor offices, finally we know I have allergies and I've started allergy shots as of this week. 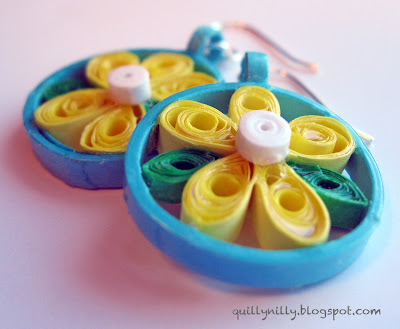 I'm hoping this will allow me to get back into quilling, I miss it. I was fortunate enough to attend Scrap Pink this weekend at my favorite scrapbook store, Eclectica. We laughed, laughed till I cried. We shared yummy recipes. We won door prizes and contests. And we created. I had a blast. I entered the paper doll contest, we each were given a paper doll and a few hours to decorate that doll; and I won. Woo hoo, a $10 gift card! Here is my surfer girl paper doll.